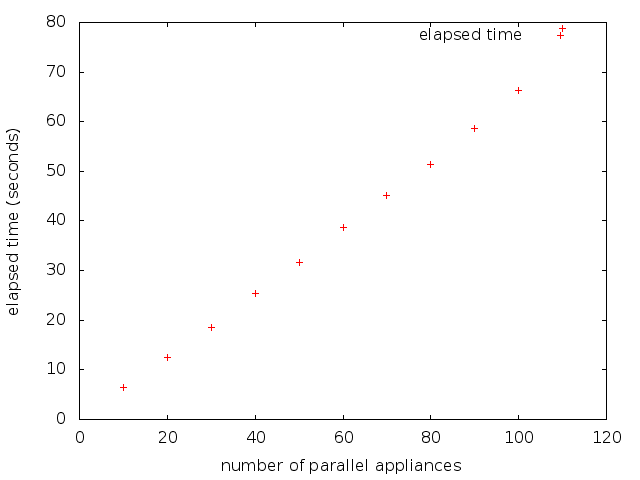 A problem encountered in part 2 was that I couldn’t measure the maximum number of parallel libguestfs appliances that can be run at the same time. There are two reasons for that. The simpler one is that libvirt has a limit of 20 connections, which is easily overcome by setting LIBGUESTFS_ATTACH_METHOD=appliance to eliminate libvirt and run qemu directly. The harder one is that by the time the last appliances in the test are starting to launch, earlier ones have already shut down and their threads have exited. What is needed is for the test to work in two phases: In the first phase we start up all the threads and launch all the appliances. Only when this is complete do we enter the second phase where we shut down all the appliances. The easiest way to do this is by modifying the test to use a barrier (or in fact to implement a barrier using the condition primitives). See the modified test script below. die "launch failed with $nr_threads threads: $err"